Rainbow - The Film drops on August 10. One year after the release of her latest studio album Rainbow, Kesha is celebrating the project with a behind-the-scenes documentary via Apple Music. 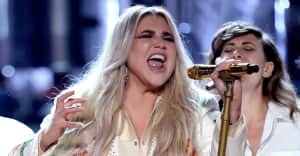 The Magic Seed-produced doc, titled Rainbow - The Film, is scheduled to drop on August 10 and is directed by Kesha, Lagan Sebert and Kevin Hayden. "Making Rainbow the album was such a therapeutic process and given the opportunity to turn it into a three dimensional piece of art has helped me find even deeper healing and catharsis," Kesha said in a statement. "I hope this film inspires others to never give up even if you feel full of hurt or lost, because after the storm comes a rainbow. Depression, anxiety and mental illness are things we all need to talk about more, and there is no shame in asking for help. Making the decision to work on yourself is the bravest thing you can do. I hope this film helps bring light and love to everyone."